The mentioned in the previous paragraph is also known as cross-infection, ie, infection from patient to patient via the hands of professionals. A microorganisms acquired in their hands by health professionals during direct contact with patients or with the objects around them, are called transient flora. 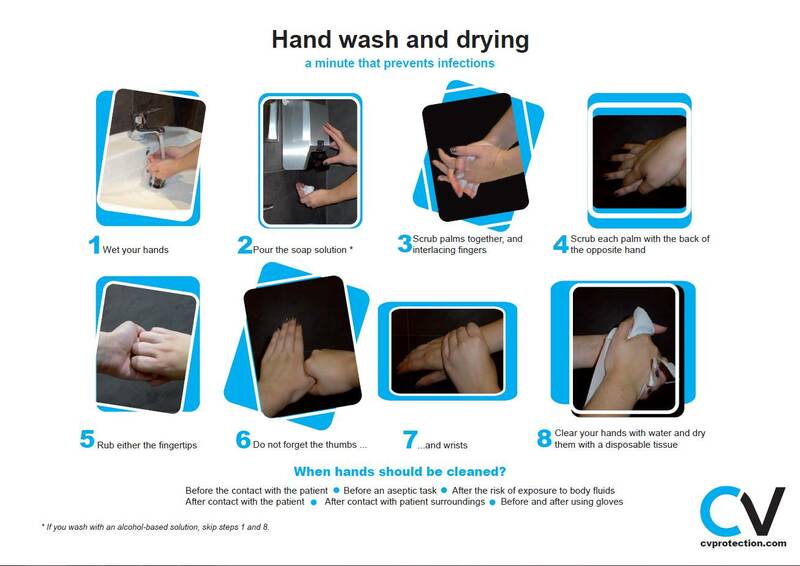 It is proven that hand hygiene is the simplest and most effective method to reduce HAIs. But the truth is that health professionals wash their hands half than they should, due, mainly, to the following causes: ignorance of the problem, too much work, the limited availability of washing points, the non-appearance (or no consciousness) of dirty hands, skin irritations caused by laundry products, etc. 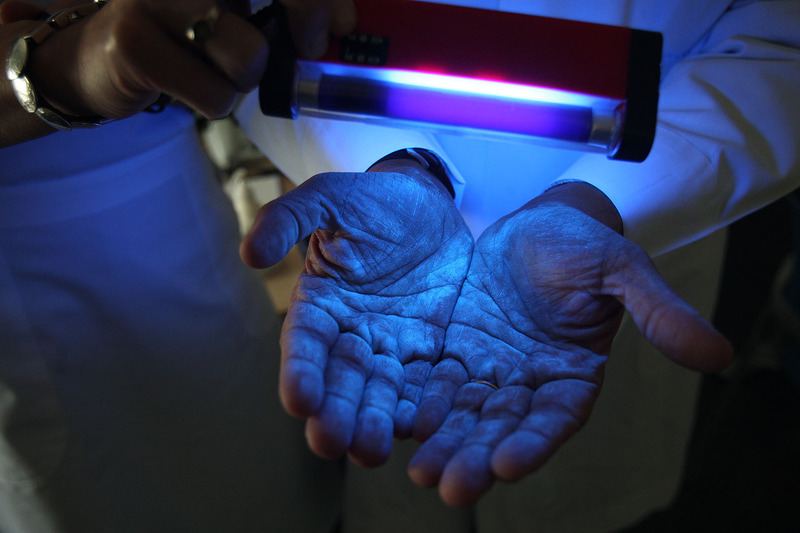 The Department of Preventive Medicine of the University of Navarra made this ​​photograph that shows the dirty areas of the hands, using ultraviolet light, because of the World Handwashing Day (May 5). In CV Protection we have the equipment for this test available, very useful in preventive medicine departments of hospitals, areas where we have to verify the absence of transient flora, trainings of hand hygiene for the staff, etc. For more information, please get in touch with us. Once clarified the key concepts, we should specify that we only are going to go into detail about the process of hygienic hand washing. When hand should be cleaned? 1. Before the contact with the patient. 3. After the risk of exposure to body fluids. 4. After contact with the patient. 6. Before and after using gloves. 1. Remove watches, rings, bracelets, etc. and wet your hands. Remember that the use of these accessories is strongly discouraged during the course of the workday. 2. Pour the soap solution (pH neutral or slightly acidic). 3. Scrub palms together, and interlacing fingers. 4. Scrub each palm with the back of the opposite hand. 5. Rub either the fingertips together. 8. Finally, clear your hands with water and dry them with a disposable tissue. Hand dryers and drying reusable elements are conducive to germs and bacteria proliferation. * If washing is done with a alcohol-based solution, steps 1 and 8 are excluded from the process (total duration 20-30 seconds). It is very important to close the tap with the paper before throwing it (if not have a foot or elbow operated system) because if we touch it after washing, hands would be contaminated again.